Wargame News and Terrain: Element Games: Discounted Age of Sigmar Gloomspite Gitz Goblins and Double Loyality Points! 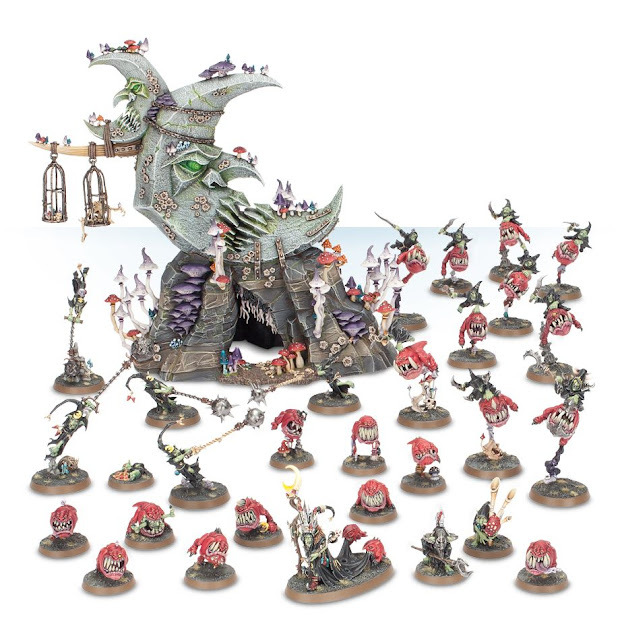 Element Games: Discounted Age of Sigmar Gloomspite Gitz Goblins and Double Loyality Points! Element Games launched the discounted pre-order for the brand new Games Workshop Warhammer Age of Sigmar Gloomspite Gitz Goblins. The Gloomspite Gitz are arriving and they're bringing a whole host of green-skinned moon fanciers with them! Grab the Battletome: Gloomspite Gitz which contains all the rules you need to build an army of Gloomspite Gitz full of brand new Age of Sigmar background. Including warscrolls for the following faction keywords: Moonclan, Troggoth,Spiderfang, and Gargant. Field armies of savage Gloomspite Gitz Squig Hoppers and Squig Herds along with legions of Goblin Grots and Fanatics lead by Skragrott The Loonking in the shade of the mighy Bad Moon Loonshrine idol. The Gloomspite Gitz are arriving and they're bringing a whole host of green-skinned moon fanciers with them! Make sure to grab your own new army and units here at Element Games offering you one of the best online deals along with double loyality points if you decide to use our free and exclusive TIM940 code at the webstore checkout.